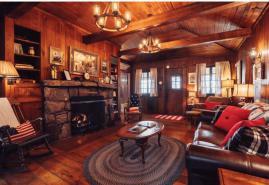 Finding the perfect cabin in the Chattanooga area can be a Goldilocks experience. This one’s too small. This one’s too big. This one’s too far from the Tennessee Aquarium… Fortunately, a little online searching can uncover the perfect cabin in the woods for you and your family. We highly recommend going this route – it beats getting chased out by angry bears. But there are so many listings for cabins in Chattanooga it’s easy to get lost in the online weeds. 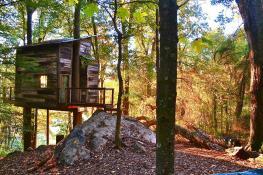 Click here to see the full-list of Chattanooga cabins and vacation rentals. 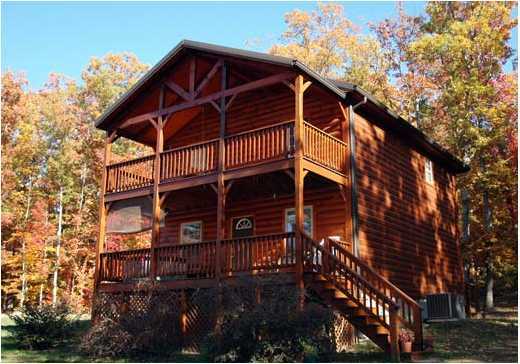 Cabins in Chattanooga are perfect for family vacations or couples preferring a bit of privacy in rustic or modern cabins. 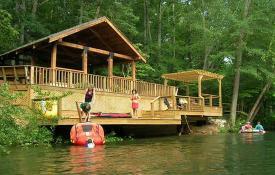 Chattanooga Vacation Rentals currently has 20 cabins and homes available for rent around the Chattanooga area. The historic Pot Point Cabin on the Tennessee River sleeps up to 10 and the Trail’s End log cabin on Signal Mountain sleeps up to 12. For couples, the two person shed in Wildwood is just 12 miles from Rock City and 18 miles from downtown with a hot tub and a beautiful view of Lookout Mountain. The Cottages in the Clouds are located high atop Lookout Mountain and feature five log-sided houses surrounded by eight wooded acres. You can enjoy a fire pit, gazebo, and grassy lawn for football or frisbee on the property, and each cottage has its own porch (some even have hot tubs). Owner Stan Gravitt is a general contractor and personally built each home in 2005, so expect cozy yet modern amenities, like gas fireplaces and WiFi. Welcome Valley Village also offers five log cabins tucked into beautiful woods, but is located along the Ocoee River near Benton, TN (45 minutes from downtown). Nestled in the foothills of the Smoky Mountains, it’s just two miles from the Cherokee National Forest, offering whitewater rafting, fishing, hiking, tubing, horseback riding, mountain biking and more. Of course, the cozy cabins beckon you to stay indoors with stacked stone fireplaces, wooden walls and exposed beams, and Jacuzzi tubs in most. An onsite pavilion offers a large grill, picnic tables, wrap-around porch, and riverside dock for fishing or water access. If it’s rustic charm you’re after, Scenic View Log Cabins has it in spades. Each of the 12 Chattanooga cabins – which range from one-bedroom to two-bedroom – were built onsite by the owner, using logs and stones from the property. Located off Burkhalter Gap Road, about halfway down Lookout Mountain, Scenic View cabins live up to their name with vistas of the valley and Sand Mountain in the distance. It’s about a 10 minute drive from Canyon Grill Restaurant – a hidden gem tucked on the back of Lookout – and 15 minutes from Lookout Mountain attractions. Downtown is about 30 minutes away. 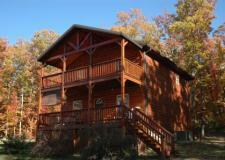 Linens and towels are provided and some cabins offer whirlpool tubs and kitchens. NOTE: Google maps has the wrong location, so be sure to confirm directions. If you&apos;re a self-proclaimed history buff, a stay at Battlefield Station is right up your alley. This turn of the century log cabin is located on the Tennessee side of Lookout Mountain just minutes from Downtown Chattanooga and the Lookout Mountain attractions. The cabin is also located near the Chickamauga & Chattanooga National Military Park, where the "Battle Above the Clouds" took place during the American Civil War. Make a point to enjoy the views from Point Park and tour the Craven&apos;s House before you cozy up by the fire at this historic cabin. BONUS: Although this Treetop Hideaway isn&apos;t technically a cabin, the rustic retreat is the perfect place to stay if you need a little peace and quiet. This chic abode is climate controlled and comes complete with a bathroom and stocked kitchenette, which is perfect for those who prefer to "glamp." Enjoy s&apos;mores by the fire as you overlook the misty valley and the nearby creek from the treetops. Click here to see the full-list of cabins and vacation rentals.